FILE - President Donald Trump holds up a signed executive order in the Roosevelt Room of the White House in Washington directing the Interior Department to begin a review of restrictive drilling policies for the outer continental shelf, April 28, 2017. President Donald Trump on Tuesday hailed an energy revolution marked by surging U.S. exports of oil and natural gas. Trump cited a series of steps the administration has taken to boost energy production and remove government regulations that he argues prevent the United States from achieving "energy dominance" in the global market. "Together, we are going to start a new energy revolution — one that celebrates American production on American soil," Trump said in a statement, adding that the U.S. is on the brink of becoming a net exporter of oil, gas and other energy resources. The self-proclaimed "energy week" follows similar policy-themed weeks on infrastructure and jobs. At the White House, Energy Secretary Rick Perry said the administration is confident officials can "pave the path toward U.S. energy dominance" by exporting oil, gas and coal to markets around the world, and promoting nuclear energy and even renewables such as wind and solar power. Energy Secretary Rick Perry speaks during the daily briefing at the White House in Washington, June 27, 2017. "One of the things we want to do at [the Department of Energy] is to make nuclear energy cool again," Perry said. The focus on energy began at a meeting between Trump and India's Prime Minister Narendra Modi, with U.S. natural gas exports part of the discussion. Trump is expected to talk energy Wednesday with governors and tribal leaders, and he will deliver a speech Thursday at the Energy Department. Trump signed an executive order in April to expand oil drilling in the Arctic and Atlantic oceans, reversing restrictions imposed by his predecessor, Barack Obama. Trump has also pushed to revive U.S. coal production after years of decline. Coal mining rose by 19 percent in the first five months of the year as the price of natural gas edged up, according to Energy Department data. U.S. oil and gas production have boomed in recent years, primarily because of improved drilling techniques such as fracking that have opened up production in areas previously out of reach of drillers. A report released in January by the Energy Information Administration said the country is on track to become a net energy exporter by 2026, although the White House said Tuesday that net exports could top imports as soon as 2020. FILE - U.S. 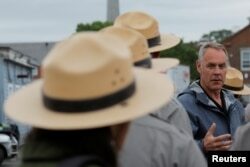 Interior Secretary Ryan Zinke talks to National Park Service rangers while traveling for his National Monuments review process, in Boston, Massachusetts, June 16, 2017. Interior Secretary Ryan Zinke also focused on energy as he addressed the Western Governors' Association in his hometown of Whitefish, Montana. Zinke said increased offshore drilling could provide more than enough revenue to offset an $11.5 billion maintenance backlog in national parks. "There's a consequence when you put 94 percent of our offshore off limits. There's a consequence of not harvesting trees. There's a consequence of not using some of our public lands for creation of wealth and jobs," he said. Despite Trump's withdrawal from the global Paris climate accord, Perry said the U.S. remains committed to reducing greenhouse gas emissions that contribute to global warming. He called nuclear power a key element to fight climate change.